Winter is a time of year that most people tend to think of as very monochromatic – whites and grays, perhaps a bit of blue, and maybe some green from the conifers. And, on the landscape scale, this is probably reasonably accurate. However, when you start poking around, you can turn up some fabulous colours. 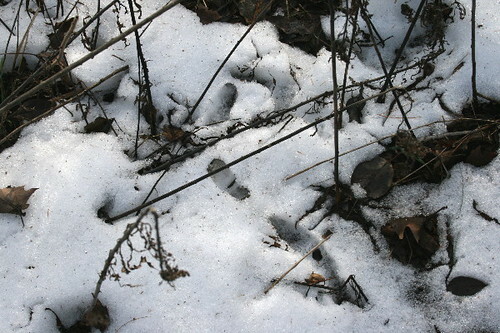 My mom suggested this as a topic for a post, and so we went out this afternoon to do some hunting. This photo was taken from the Sugar Maple in my parents’ front yard. It’s an old tree, in the twilight of its life. When I was a kid we had a swing made from a tire hanging from one of its sturdy branches, and a treefort high in the fork of its trunk. It was a healthy tree then, without any blemishes or disease. Since then I’ve watched as some branches have died, leaving gaps in its crown that look like somebody’s taken a quick bite for a midnight snack. The bark started flaking in some spots, and the branch with the swing is long gone. And, perhaps the most obvious sign of a tree in decline, its trunk started blossoming in richly-coloured flora. Well, not flora, exactly. The growth is actually lichen, which isn’t technically a plant. In fact, it’s not easily classified, because it’s not a single organism, it’s two – a fungus (which is its own type of organism) and an algae (which is a completely different type of organism), partnered together in a symbiotic relationship that benefits both. 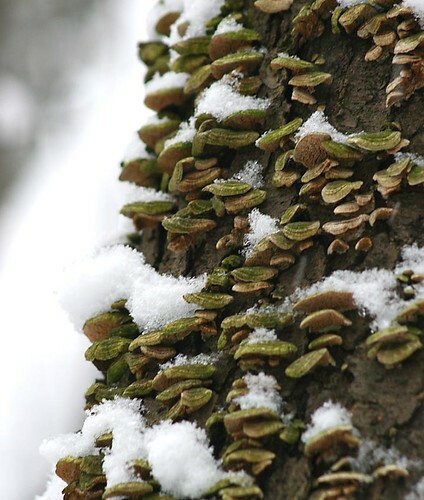 Although technically the fungus and the algae could live independently, they find it suits them both, especially in harsh or difficult conditions, to partner up so each only has to do half the work. The algae contributes to the partnership by photosynthesizing sugars, much like trees do. It’s the algae that gives lichen its green or blue-green (or sometimes red or brown, depending on the particular type of algae) colour. The fungus, meanwhile, is the house the algae lives in, and it pulls in minerals and nutrients necessary for the pair’s survival. There are over 25,000 species of lichen in North America alone. Each species is incredibly well-adapted to a particular niche, and they can coexist easily, as you can see in the above photos. Because of the vast number of species, and the superficial similarity of them all to a human eye, I’m not even going to try to classify any of these to any sort of taxonomic level. It is possible, however, to group them into structural categories. 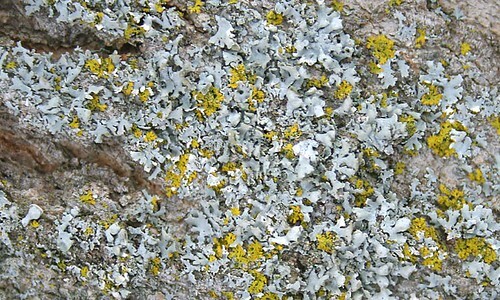 In the above photo, the lime green lichen is considered “crustose lichen” – it’s very short and relatively uniform. 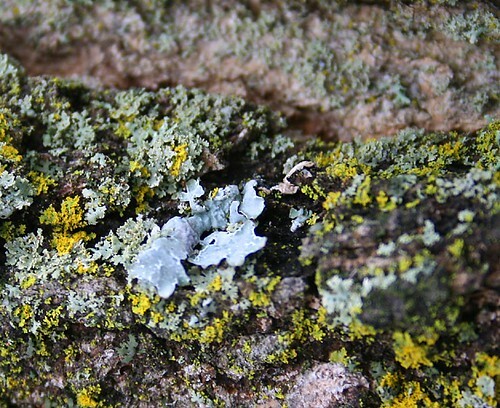 The blue-gray lichen is a “foliose lichen”, which tend to be as the name suggests – leafy and broader. A third, which does not appear on this tree but is often seen, is “fruticose lichen” – a three-dimensional lichen that resembles tiny branches or shrubs. 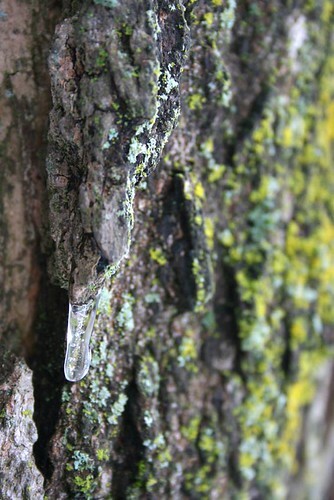 Lichen is incredibly hardy, withstanding temperatures and conditions that would see most other plants perish. It can be found in the deserts where temperatures can reach up to 50oC, or in the arctic where it may drop to -50oC. Because of their low profile, they can grow in windy environments that don’t support tall plant life. They can also survive in areas without much soil, because the fungus secretes an acid that roughens the substrate surface (such as a rock face) to allow the attachment of its root-like tendrils. If anywhere epitomizes harsh conditions, it’s Antarctica, and there are over 350 species identified from this continent alone! They take most of their nutrients and moisture directly from the air. 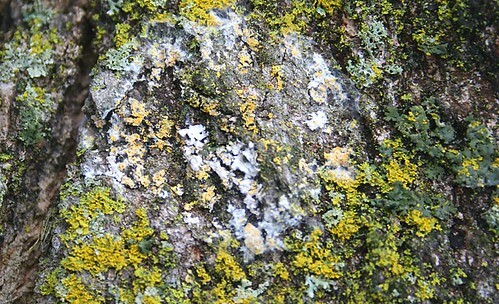 Because of this, lichens are especially sensitive to air pollution. It’s been observed that the more pollution in the air, the fewer species of lichen in an area, to the point where in the city centre there’s practically nothing. In London, England, at the start of the industrial revolution, there was so much pollution in the air from coal-fired plants that the lichen on trees in the city completely died, leaving blackened, soot-covered trunks. A moth that was patterned to camoflauge against the trunk suddenly became very obvious to predators. However, an uncommon dark morph blended in well with the new lichen-free trees, and within a short time nearly all of the moth population were dark. 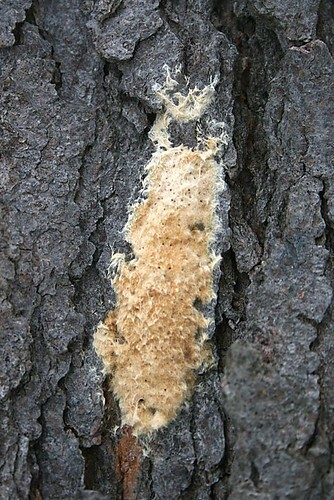 When the air was eventually cleaned up lichen returned to the trees, and the moth reverted to its peppered form. 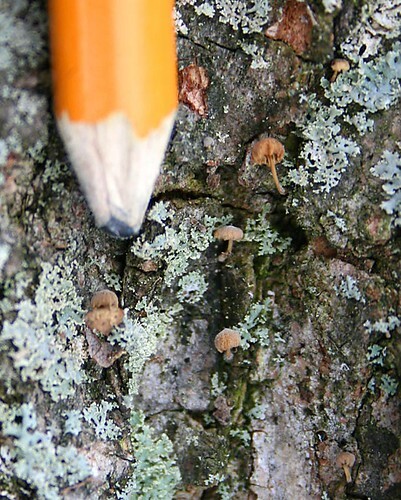 Lichen tends to grow very slowly, at about 1mm per year. 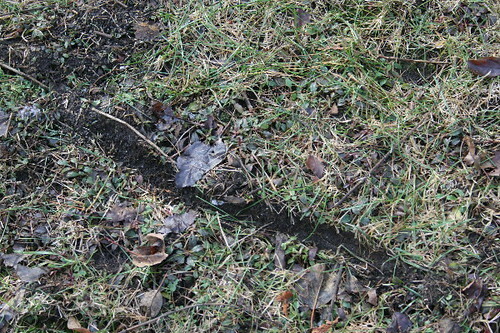 Some especially dense patches can be dozens, if not hundreds of years old. Another old tree in the front yard is a Silver Maple. Although we never played on this tree, it, and its sister a few yards away, have framed the front of the house for decades, and certainly it’s a fixture that I can’t imagine the house without. 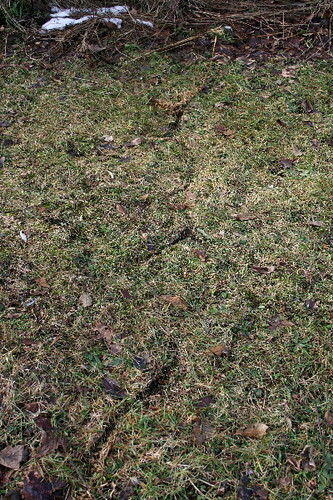 It must be almost as old as the Sugar Maple, and although it’s retained all of its major branches, the lawn is always littered with small- and medium-sized ones in the spring or after a good storm. 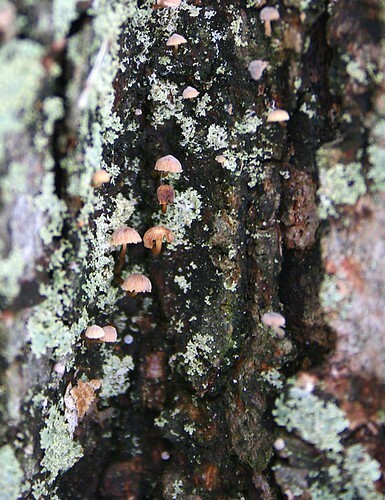 Sure enough, when I investigated it had its own patch of lichen along a lot of its lower trunk. There weren’t as many varieties as on the Sugar Maple, I only really noticed two, and one was the same blue-gray type. 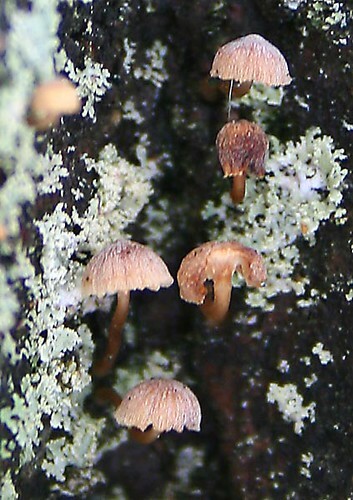 However, after running off a few shots I peered closer and discovered really, really tiny mushrooms, only 2 or 3mm across, growing amongst the lichen patches! Proving that there’s always more to learn about nature, last week while visiting my parents, my mom shared a tidbit she’d recently read in a library book she was working on. Apparently, you can track the annual growth of twigs on living trees using structural markers, much the same way you could count rings on a stump of a felled tree. Intrigued, I headed outside to check it out for myself. I had noticed that the buds seemed to be out on the maple trees in the front yard, and wondered whether the warm spell had encouraged them to grow. When I paused to think about it, though, I didn’t really know at what point in the winter buds start appearing on trees. I kind of thought March, but it could be earlier. So I looked it up. 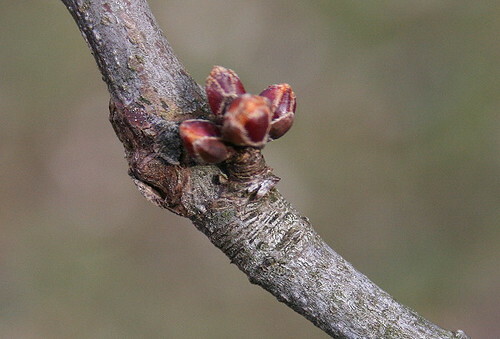 Turns out, trees actually form next year’s buds at the end of the summer. In thinking about this, it makes sense, because deciduous trees are dormant over the winter, going into a low-energy stasis (much the way the Red Squirrel does!). The buds on most trees are formed at the base of the current year’s leaves, but they’re tiny, barely noticeable. 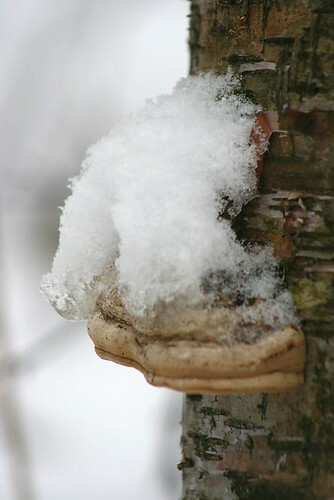 It’s during the late winter, as the days start warming up and the sap starts to flow again, that the buds begin to swell and develop. Some early swelling can take place in warm spells mid-winter, and I guess that’s what I’d been seeing. 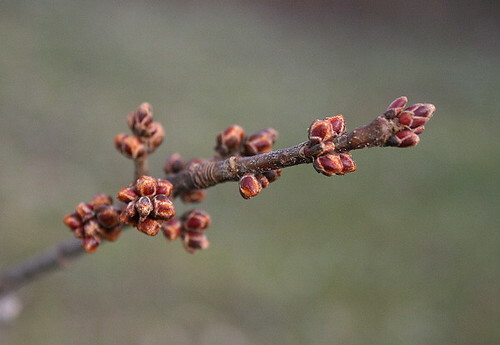 I’ve also generally assumed these buds to be leaves, but they’re actually the flower buds – the leaves develop in the early spring, after the flowers are blooming. Although Silver Maples have both male and female flowers on the same tree, they tend to produce a majority of one gender or the other, resulting in either very low, or very high seed crops on a single tree. Back to the purpose of my outing, when I took a close look at the twigs of the Silver Maples in the yard, I could immediately see the rings in the bark that indicated the base of previous years’ growth. In the above photo you can see a number of rings circling the twig just under the bud. 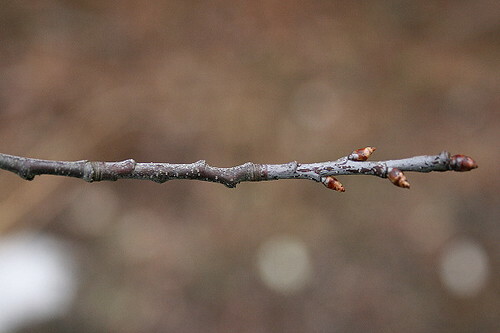 The rings are formed at the base of the buds (you can see some rings underneath the little stem supporting the buds in this photo, as well), and the twig’s new growth starts from the terminal buds. As the twig grows, the rings from where the terminal bud had been remain. The amount of growth from year to year seemed to vary greatly, and the amount of growth from twig to twig was also extremely variable. 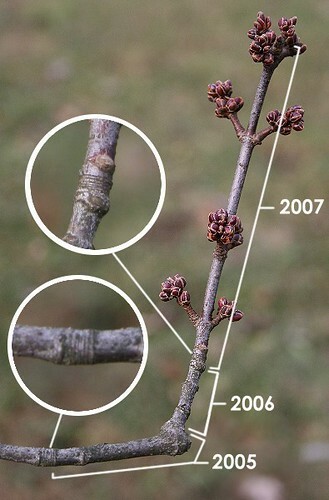 Here you can see the “growth rings” from the preceding three years (the 2008 rings will be at the tip of the current twig, when it starts to grow this spring, so the rings shown here indicate the base of the 2007 and 2005 growth – the base of the 2006 growth is harder to see because of the knobbly bit). As you can see, the twig grew considerably more in 2007 than it did in 2006 or 2005. In this case, I think in 2006 it started growing a side twig after the terminal twig was broken off, resulting in the funny bend, which may also have reduced its total growth that year. I was so pleased with the discovery, I had a look at a few other tree species to see if it was as easy to detect. It was. Below is a twig from the Chokecherry in front of the house. The annual growth of this twig was more even between years, but I notice it also didn’t grow as much as the maple did in a year – about 5cm compared to the 15cm in 2007 for the maple. Despite what I thought while growing up, Red Squirrels don’t hibernate in the winter either. Instead, they build caches of food near their nest during the fall, which they use, in combination with stored body fat, to get through the winter. They spend most of the winter within their nest, minimizing their amount of activity, and therefore required energy. Because their caches are usually quite close to their nest, they don’t have to stray far, or be out for long, and are not seen often as a result. So I was delighted to notice that the warm spell had encouraged the resident Red Squirrel to venture out to the feeders to stock up the cache. He (or she) was incredibly quick, dashing from the roof down the tree to the driveway, grabbing a few seeds and perhaps a chunk of bread (my mom throws out the end slices as a treat for the crows), and then turning tail and dashing back up the tree with barely a hesitation. 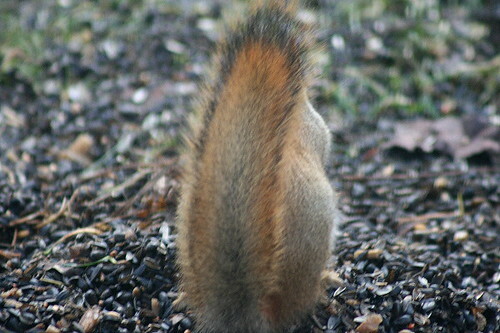 Most of the photos I got of him were of his rear end as he paused to gather some food. I think he may have been nesting in my parents’ attic, or alternatively in the spruce trees that line the back of the house (the branches of which are a squirrel’s jump away from the edge of the roof). I could tell when he was coming back to the tree to scurry down to the driveway because of the pitter-patter of little feet across the roof above. 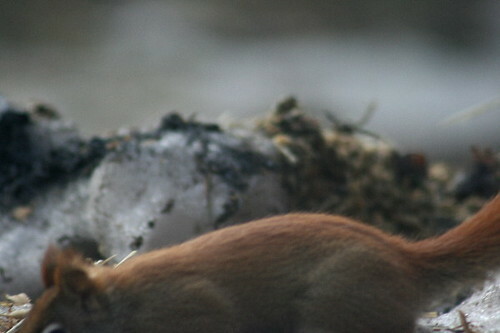 Red Squirrels usually maintain several nests within their territory (which may be up to 50m in diameter), but tend to favour White Spruce as the nest tree. 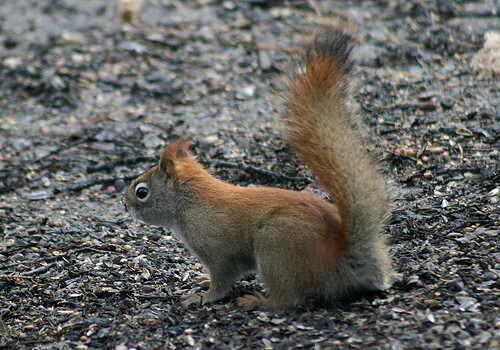 Spruce seeds make up more than half of the average Red Squirrel’s diet. 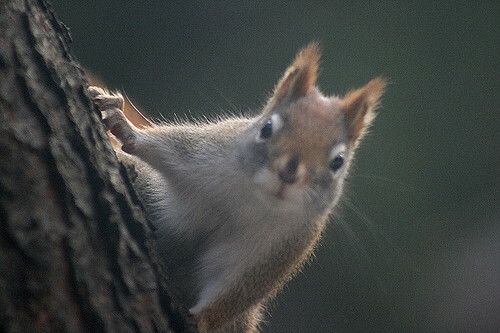 I find Red Squirrels to be especially wary. When walking in the woods, they don’t hesitate to dash up a tree and sit on a branch scolding you, even before chipmunks or Gray Squirrels that might also be in the area. In the case of this guy, I had to either be very still at the window (which meant standing with my camera posed for the shot), or stand back from the window. At the slightest movement he would dash halfway back up the tree, where he would pause and investigate the threat (me) for a moment or two. Either that, or take back off straight up the tree if he’d already gathered up some food. More often than not, this was the shot I got! My parents live in a 100-odd year old farmhouse out in the country west of Toronto. Sharing the building with wildlife was part of growing up, whether it was bugs or vertebrates. We had mice in the walls (occasionally seen scurrying across the kitchen floor), starlings in the eaves, snakes and newts in the unfinished basement, squirrels and bats in the attic. Most of our houseguests were primarily active during the spring and summer months. 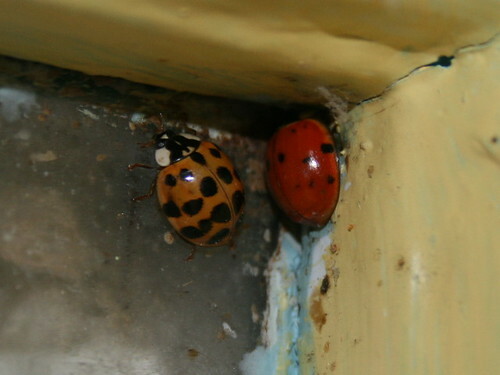 In the winter, our primary visitors were, and are, ladybugs. Anyone in an older home is probably familiar with the mid-winter ladybug invasions that seem to coincide with warm spells. Within the space of a few days, the house seems to become overrun with them. They gather in the corners of window frames, congregate around light fixtures, and seem to find their way into or onto just about everything – hair, clothing… food… Just where do all these bugs come from, in the middle of winter when insect life, as a whole, is pretty absent? Growing up I used to think that the warm spell encouraged a hatch of ladybug eggs that had been laid in the fall before the first frosts. Actually, all of these uninvited guests are adults, that crawled under the siding or into the cracks of the house in the fall to overwinter. In the warm spell, they awaken and start to move around, and the warmer temperatures indoors draw them inside through small cracks in the walls or around the windows. I know that in my parents’ 100-year-old farmhouse, the insulation is not quite up to modern-day standards, and there are ample opportunities for a little beetle to squeeze in to the much more habitable warmth of the indoors. The ladybug most people are familiar with is the Multicolored Asian Lady Beetle, an extremely variable ladybug that comes in a wide range of colours and spottiness. Above you can see two very different colour variations of the same species. It’s also the primary culprit in winter home invasions. The species was introduced in Louisiana and Mississippi in 1979 and 1980, as a method of controlling aphids and other agricultural and horticultural pests. They’ve spread a long way since then! You can actually buy ladybugs commercially from garden centres or online to release in your garden as a natural pest-control method. Ladybugs in and of themselves are essentially harmless, although they can be a bit of a nuisance during their winter invasions. Once the temperature drops following the warm spell, ladybugs that have come into your home will congregate in corners where they will resume their hibernation. During the winter they live off stored fat reserves, but the dry air in most homes during the winter can cause dehydration in these little bugs that results in piles of dead bodies. 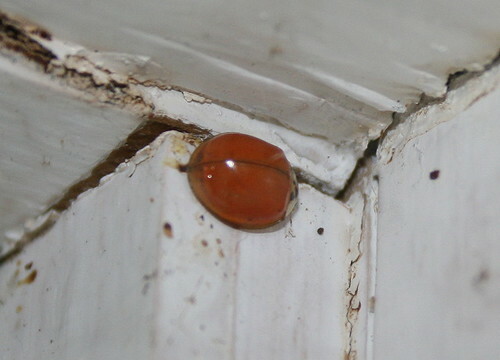 Ladybugs that manage to make it into enclosed light fixtures usually can’t make it out again and collect in the bottom. Aside from this, the ladybugs leave little stains that, growing up, I took to be “ladybug poop” in the corners where they congregate. 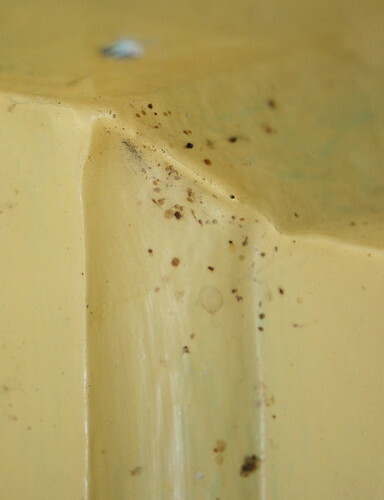 In actuality, these stains are the result of the ladybugs being startled, threatened or stressed. As a defense mechanism, ladybugs have the ability to excrete some of their “blood”, which has a bright yellow colour and rather sharp, and not altogether pleasant, smell, which discourages potential predators. In prepping the windowframes of my parents’ house for repainting this winter I could easily tell where the ladybugs had been. I was rather surprised that our recent warm spell didn’t cause the sort of mass invasion I tend to expect with higher temperatures, and while I came across little groups of ones or twos in most corners of the house, there weren’t the large groups I associate with mid-winter warming. Something yet to look forward to, I guess! …there was nothing. Then there was the first post. My vision for this blog is to share interesting observations and tidbits and factoids from nature and the great outdoors. I hope to be able to share some of the the things I see and stuff I know, and learn a little bit in the process!